Rest of Africa retail investments. Value is created by effectively allocating manufactured resources and their subsequent development and/or management. Mall of Africa won the Sunday Times Generation NEXT award for the coolest mall. Focus on property fundamentals Continuous First key value driver: South African portfolio. Focus on achieving KPIs set for the development team Partially Second key value driver: Waterfall development. Target 30.0% growth in distributions ✓ Third key value driver: Investment in MAS. Focus on improving operational performance Continuous Fourth key value driver: Rest of Africa retail investments. The value of our existing South African portfolio increased to R21.1 billion (2017: R18.1 billion), making up 72.5% (2017: 66.1%) of our total gross assets. The MOA is at the heart of the Waterfall development, our competitive advantage. Office and mixed-use, as well as light industrial buildings, surround the mall, densifying Waterfall City. The future first-class residential offering will further complement the city and support a “work, live, play” lifestyle. We introduced the FRESH (fun, relevant, easy, social and helpful) concept as a focus point for our property management team. The aim is to create a compelling, enjoyable experience that surprises and delights our customers (shoppers and tenants) and makes them smile. Leasing and vacancy management is aimed at attracting new tenants and long-term tenant retention. A number of our newer properties have single tenants with long-term leases, resulting in a longer-dated lease expiry profile (below). Our weighted average lease expiry profile increased to 6.8 years (2017: 6.4 years). During the year, leases totalling 90 909m2 expired, with 24 996m2 (27.5%) renewed, 20 732m2 (22.8%) relating to PwC vacating the 2 Eglin building, 42 296m2 (46.5%) leased by new tenants and 2 885m2 (3.2%) remaining vacant. 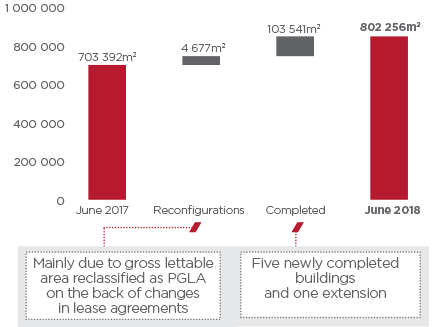 Overall portfolio vacancies, measured in terms of PGLA, increased by 41 669m2 when compared with 30 June 2017, mainly as a result of PwC moving into their new head offices at Waterfall City, vacating 2 Eglin Road, Sunninghill. Subsequent to 30 June 2018, 21 791m2 of total vacant space was let, reducing the overall vacancy rate to 5.1%. Vacancies that were filled post 30 June 2018 relate mainly to a portion of 2 Eglin Road, Dis-Chem warehouse and Gateway West. Vacancies not yet filled refer to 2 Eglin Road, Brooklyn Bridge Office Park and the Newtown precinct. The credit quality of tenants in our portfolio is reflected in the high percentage of A-grade tenants. 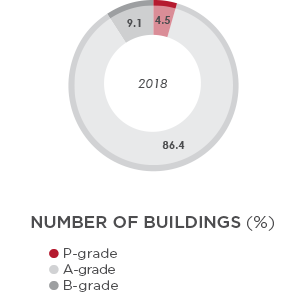 The majority of our tenants, 78.7% (2017: 72.2%) by PGLA, are categorised as A, being large international and national tenants, large listed entities, and government or major franchises. Smaller international and national tenants, listed tenants, franchisees, medium to large professional firms categorised as B, make up 16.4% (2017: 22.4%) of our tenancy. The balance comprises 326 (2017: 369) smaller tenants and sole proprietors categorised as C.
Arrears management is a proactive process to ensure consistent progress in the current economic climate and given the increased cost of occupancy for our tenants. To mitigate our exposure, processes for tenant credit assessment and ﬁnancial vetting are conducted upfront and throughout the lease tenure. 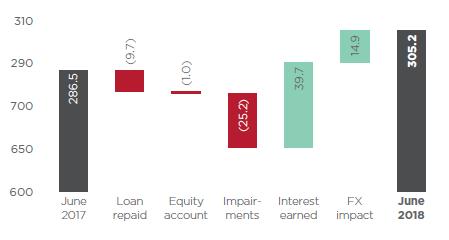 Through close relationships with our tenants and understanding their needs and business challenges, we are managing arrears effectively and proactively to mitigate potential losses. The capitalisation and discount rates for the 2018 valuations remained largely unchanged when compared with the previous year. 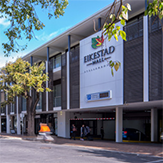 Fair value adjustments on buildings in the South African portfolio were negatively impacted by impairments on 2 Eglin, Newtown precinct and Brooklyn Mall. The negative fair value adjustment on Newtown precinct is due to lower rental projections while Brooklyn Mall’s valuation decreased due to rental income being negatively impacted by increased competition in the area. * Sector net operating income, excluding straight-line lease income adjustment as % of total net operating income, excluding straight-line lease income adjustment. 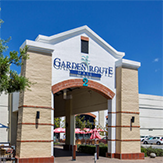 Lynnwood Bridge retail is being upgraded and refurbished, enhancing the shopper and tenant environment. In 2018, the retail environment was affected by corporate failures and rescues, including the Edcon Group, Stuttafords, Deeghuys and Melissas. As part of the Edcon restructure the teams evaluated the trading density, rent to sale ratio in relation to the tenant mix with each mall and Edcon tenant. We have negotiated a structured reduction in our exposure to the Edcon Group that will be implemented between June 2018 and April 2019. As a result, we managed to introduce new tenants in prime locations into our portfolio, provide additional diversity in the tenant mix and reduction of our financial exposure to the Edcon Group. Top Shop of 770m2 at Mall of Africa will be subdivided into three new stores, providing more diversity in the tenants mix and improving the mall net operating income. We are monitoring growth in the online retail market. This has been slow to develop in South Africa, but could accelerate at any time. According to Macquarie research on online retail in South Africa, the market is still in its infancy with high entry barriers. Nevertheless, we need to embrace and understand technology to assist our tenants in ensuring we create the ultimate consumer experience at our malls. 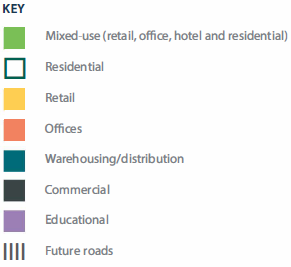 The focus in our retail portfolio in the past year remained on trading densities. By looking at footcount and reconfiguring floor space, we ensure our retailers operate and trade at their optimal size. 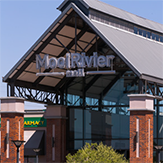 Examples of reconfiguration include Mr Price Group at MooiRivier Mall, supporting better trading densities and creating an opportunity for Woolworths to expand. In total, 16 reconfigurations and replacements at Mall of Africa led to an increase of 236.0% in turnover on the same footprint for December 2017 versus December 2016. In the retail environment, tenant retention is becoming more challenging. The tenant-mix trend is also shifting to food and beverage, and experiential tenants versus traditional fashion retail. By optimising and reconfiguring our tenant mix (rightsizing tenants), we address shopper needs and current trends, while incorporating the leisure and community ‘pull’ factor. It is important that our shoppers experience our malls as clean and safe, with helpful staff. We insist on retail floor representative training to ensure excellent service which will translate into excellent shopping experiences. Technology is an enabler to maximise the customer and tenant experience. During the year, we introduced ticketless parking at Mall of Africa via number plate recognition technology. 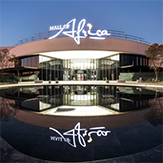 Mall of Africa also mimicked the ‘one day only’ concept originated by online retail and generated 74 000 interactions with its two-week ‘11-hour sale’ campaign, which has become a bi-annual event. We gained a better understanding of shopper movement in our malls, dwelling times and shopfront efficiency as well as shopper retention rates inside tenanted areas by using anonymised location monitoring WiFi. Given the oversupply of office space in key nodes such as Sandton and, to a certain extent, Rosebank, tenants are spoilt for choice and well informed about current vacancies and rental price trends. Office space is widely available and landlords are offering incentives, such as reduced rentals, to fill premises. Negotiations with new tenants have become protracted and more challenging. We compete by demonstrating the value of relocating to Waterfall and, most importantly, focus on cost of occupancy for our tenants. To retain existing tenants, our focus is on building long-term relationships and constantly staying abreast of their changing property and business needs. Our focus is on the tenant experience, stronger sales teams and fostering our tenant relationships (see social and relationship resource) as our unique value propositions. 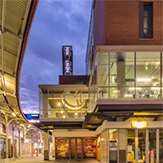 Current office and mixed-use trends include growing demand for flexibility in the workspace. Tenants are increasingly looking at precincts that are close to amenities and transport. The ground and first floors of The Majestic (Newtown precinct) are currently not used by Nedbank. Alternate architectural plans have been prepared for a possible new tenant. Our industrial node at Waterfall Logistics Hub is ideally positioned in Gauteng for modern and purpose-built warehousing and distribution centres. 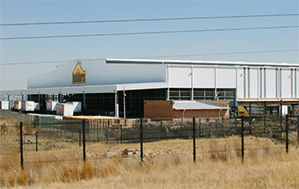 Two industrial buildings and one extension were completed during the year, contributing to a balanced South African portfolio. Stagnating rentals and rising development costs have slowed demand for industrial occupiers to take up newly developed space, focusing instead on renewing their current leases. We have concentrated on simplifying and improving design efficiency on our new warehouse developments, as well as constructing smaller-specification buildings where we believe there is greater demand and less competition. This, coupled with our advantage in the market on office and warehouse consolidations, has enabled us to attract some blue-chip tenants during the year. For example, the design of the Dimension Data warehouse reflects the trend of combining warehouse with sizeable office space. 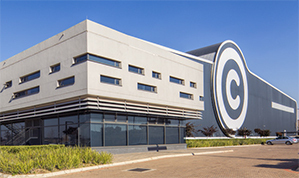 Dis-Chem signed a lease for the K101 warehouse, a 8 518m2 building developed on a speculative basis, and took occupation in August 2018. The Massbuild expansion, completed in December 2017, increased our primary lettable area by 9 839m2. During the year, we noted an increased focus on utility costs and a requirement for more modern infrastructure, coupled with the growing popularity of a tenant-owner model. We are focused on completing our Waterfall development pipeline, leasing the remaining speculative midi-warehouse and maintaining world-class facilities. 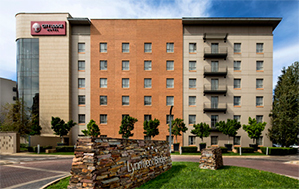 We have three hotels in our portfolio, all leased to City Lodge. 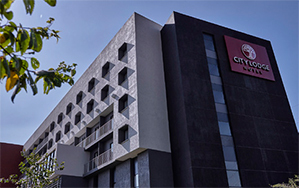 The City Lodge in Waterfall City provides an essential service to both our local and international corporate clients and remains in high demand. As Waterfall City grows and densifies we will increase our hotel offering. The value of the Waterfall development portfolio, comprising 7.8% (2017: 14.1%) of total gross assets, decreased to R2.3 billion (2017: R3.8 billion) as a result of the completion of five buildings, new developments only recently commencing and disposals to development partners. Giles Pendleton was appointed in March 2018 as the head of developments. 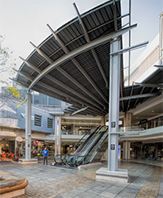 Despite a tough economic environment, we continued to receive corporate enquiries for the Waterfall precinct. Enquiries that converted into signed leases with prominent tenants include Accenture, Dis-Chem, Isuzu and Sage. 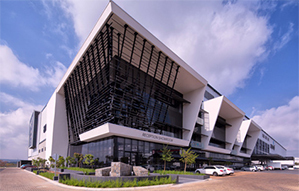 This highlights Waterfall’s emerging prominence as a suitable location for companies wanting to avoid traffic congestion and poor public transport services, as well as companies that want to consolidate offices in Pretoria and Johannesburg into a location equidistant for employees. Apart from our corporate development outlook, we have seen sustained interest in the Waterfall Logistics Hub. Land parcel 9 south is almost fully developed, land parcel 9 north is anchored by the construction of its first large manufacturing and logistics facility and the large land parcel 24 is being activated to bring onto the market in the near future. We will shortly launch Waterfall City’s first high-rise residential project as a complementary offering to the residential area and the City as well as new hospitality facilities. We believe that the residential component, as the missing element within the City, will further densify the City and contribute to our Waterfall precinct vision – where living works. Waterfall spans 2 200ha adjacent to Modderfontein in the east and Kyalami and Sunninghill to the west, creating a large commercial growth node with superb access from Pretoria via the N1, R21 and R55, and from Sandton and Johannesburg via the M1, N1, N3 and R55. We have two focus areas in the precinct: Waterfall City and Waterfall Logistics Hub. The heart of the precinct is Waterfall City, with current development bulk of 778 023m2 zoned for retail, office, industrial, hotels and residential developments. Waterfall City is built around the super-regional Mall of Africa and its adjoining 1.3ha Waterfall Park. The concept behind Waterfall City is to create a mixed-use development where people can work, live and play. 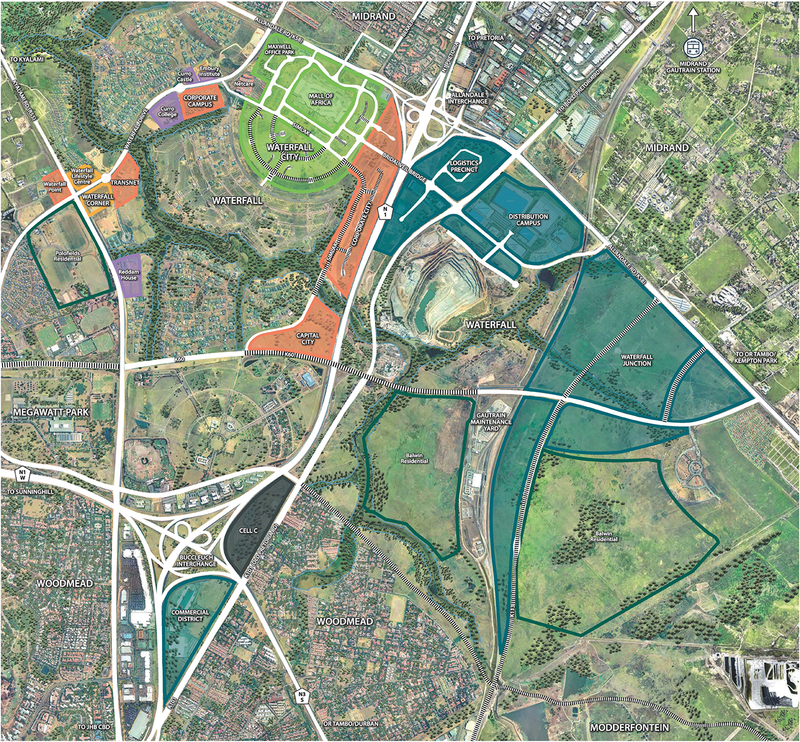 The precinct was planned as a greenfield development: allowing for the best urban design principles to determine sufficient and efficient infrastructure, services and open public spaces. Due to all developments being new, the focus is on green design and smart technology. The Waterfall area east of the N1 highway is well positioned for light industrial tenants wanting to capitalise on its central location and accessibility. The Waterfall Logistics Hub (178 985m2 of remaining development bulk) hosts only light industrial tenants, making it an attractive option to consolidate warehousing with sizeable office space, which is the current trend. We secured the majority of retail, commercial and industrial development rights and will also develop residential units. Development rights are contractual rights held to develop certain Waterfall land parcels, and form a material element of the overall land valuation. In addition to the 957 008m2 (2017: 1.0 million m2) of developable bulk, we share in development rights for two joint ventures with Sanlam. At 30 June 2018, the value of our interest in these joint ventures was R143.8 million (2017: R141.0 million). Our 1.9 million m2 (2017: 1.9 million m2) of total approved bulk is spread across 12 individual land parcels. At 30 June 2018, 23.4% (2017: 18.1%) of available bulk was completed and held, with a further 4.3% (2017: 6.5%) under construction. 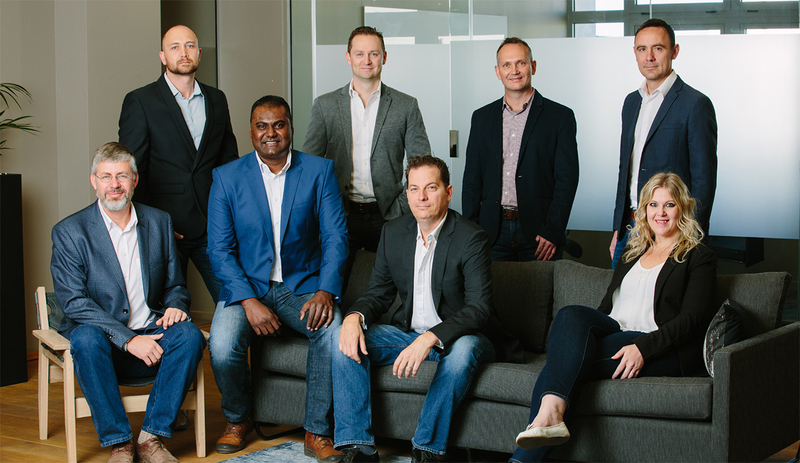 During the year, we sold undeveloped bulk into joint ventures with the following joint venture partners: Atterbury group, Barrow Properties, Sanlam and Zenprop. The balance is available for future development. In addition, we plan to increase allowable bulk on the land parcels as the spatial development framework of the City of Johannesburg evolves. * Bulk disposed in joint ventures with Sanlam. The completion of the K60 will open an east/west dual carriageway across the southern part of the Waterfall development. We are working with all stakeholders, including the Gauteng Department of Transport, to ensure timely delivery of this project. This will provide better access to our developments, as well as additional alternative transport options into the City. ~ Attacq has a 75.0% co-ownership. + Attacq has a 50.0% co-ownership. * Values provided above reflect Attacq’s undivided share in the building: 50.0%. # Estimated PGLA for Attacq’s attributable share of development. Subject to change upon final remeasurement post-completion. ^ The estimated value on completion of pre-sold and inventory is indicative of sales proceeds and not of an external valuation. ^^ Classified as inventory, the estimated value on completion equals the sales value, not externally valued. ** Not externally valued due to early stage of construction as at 30 June 2018. 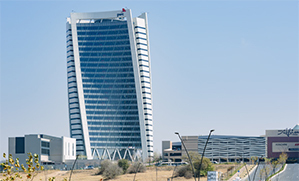 With seven developments under construction and over 37 000m2 of developments due to be completed in the 2019 financial year and a further 48 000m2 in 2020, Waterfall is a hive of construction activity. Along with site developments, significant infrastructural investment is entrenching Waterfall as a prominent business location in Gauteng. Our sustainability strategy continues to drive the development of green-certified buildings in Waterfall. 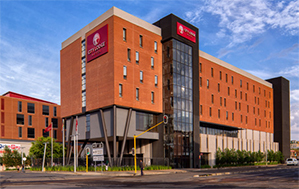 We have established a 50/50 joint venture with Barrow Properties to develop the Atria, a mixed-use precinct adjacent to the Mall of Africa which comprises four office buildings and a hotel. The initial precinct’s design has been revised, resulting in the removal of the residential component and increasing the hospitality and office components. The total PGLA is estimated at 32 000m2 at an estimated total development cost of R840.0 million. The construction of the super-basement has commenced. Construction of the top structure will be in a phased approach subject to leasing. 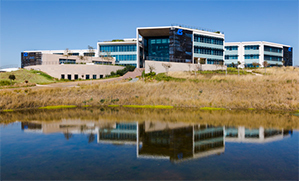 Waterfall Corporate Campus is a 50/50 joint venture with Zenprop, with an approximate total development cost of R870.0 million. The development on completion, will comprise six multi-tenanted office buildings with an estimated total PGLA of 30 000m2. Phase I, building 1 (5 868m2 of PGLA) was completed in December 2017 and is fully tenanted. The construction of phase II, which consists of two buildings and the communal area, will be completed during the second and third quarter of the 2019 financial year. One of the two buildings will be fully tenanted by Accenture SA Proprietary Limited. We commenced with phase I of a five building office development known as The Ingress. The development is located adjacent to the Novartis building and across the road from Gateway West on land parcel 10. Phase I comprises two buildings, with building one to be fully tenanted by a financial services company. The total PGLA of phase I will be approximately 8 700m2 and the remainder will be approximately 11 700m2 (20 400m2 in total). Total development cost is estimated at R570.0 million. We intend to roll out residential developments to create a “live, work, play” urban environment in Waterfall City. 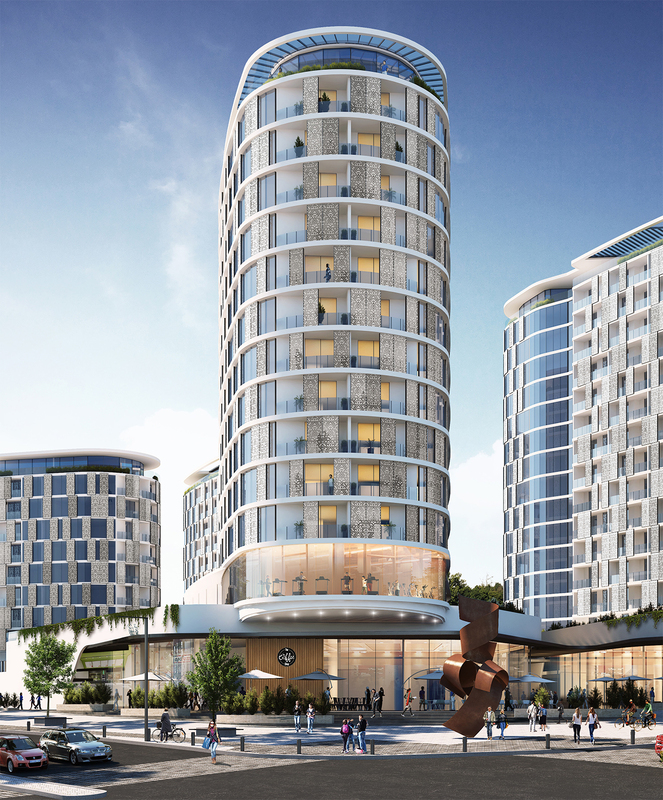 The proposed inaugural residential development will comprise four towers of approximately 550 residential units on land parcel 10, west of the Mall of Africa. The development will be undertaken on a 50/50 joint venture basis in a phased approach. Phase I will consist of two towers of approximately 250 units. The estimated development cost of R450.0 million for phase I includes infrastructure that will benefit phase II. The commencement of the development is subject to achieving a certain level of pre-sales. 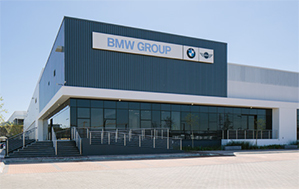 We are developing a BMW X Lifestyle Park in Waterfall City for BMW Group South Africa. The park is located on the southern side of the Mall of Africa and comprises a multi-functional event space to be used for promotional events and an off-road track designed to showcase the abilities of BMW’s X models. The initiative will create an additional attraction in the City. We, in a 50/50 joint venture with Sanlam, commenced post-year end with the development of a warehouse with adjoining offices, measuring 4 000m2 of PGLA, for Zimmer Biomet. The total capital cost for the project is R55.3 million with an estimated date of completion of June 2019. We classified 50.0% of the value of the development rights as well as infrastructure and service costs relating to Zimmer Biomet as held for sale as transfer is pending to Sanlam. Over the financial year, our shareholding in MAS reduced to 22.8% (2017: 30.6%) after we elected not to participate in its two large capital raisings. The market value of our investment, using the 30 June 2018 MAS share price of R21.00 (2017: R23.50) equates to R3.1 billion (2017: R3.5 billion). During the year, we received cash dividends of R151.0 million (2017: R105.3 million), representing a 4.9% income return based on the year-end market value. Our equity accounted investment at 30 June 2018 is R3.1 billion (2017: R2.7 billion). The net increase is due to MAS’ NAVPS increasing by 7.6% from 124.5 euro cents per share to 134.0 euro cents per share plus a 7.1% weakening of the rand against the euro. This was offset by dividends totalling 6.77 euro cents per share paid by MAS in the financial year. 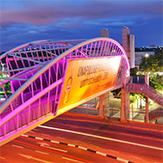 MAS is a commercial property investor, developer and operator listed on the main board of the JSE. It is also listed and admitted on the Euro-MTF market of the Luxembourg Stock Exchange. MAS’ strategy is to generate sustainable and growing distributable earnings per share by acquiring, developing and operating retail, office, industrial, logistics and hotel assets in Western Europe and Central and Eastern Europe. Where exceptional opportunities arise, MAS will embark on mixed-use or residential developments to generate recurring income or capital gains. Asset prices in Western Europe have increased in recent years and acquisition opportunities that offer an attractive return on equity are more difficult to find. MAS’ focus in Western Europe is now on opportunities that can deliver substantial value through active asset management, development and redevelopment. 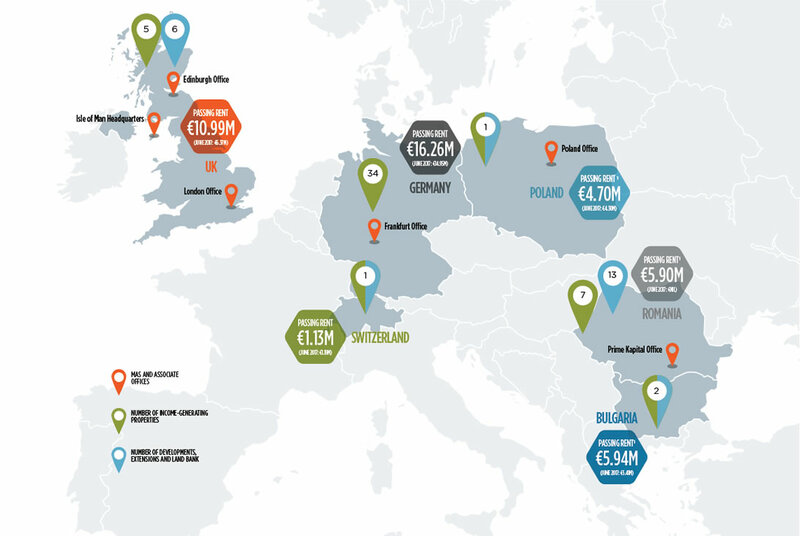 Although property prices in CEE have increased, attractive opportunities are still available, backed by a combination of relatively high initial acquisition yields, substantial growth prospects and attractive debt terms. Even more appealing is the development market which is supported by rapidly growing purchasing power and, in some cases, suboptimally designed or undersized assets suited to redevelopment or displacement. Accordingly, MAS is expanding into the growing economies of CEE. To facilitate this, MAS has partnered with Prime Kapital Limited, a management team with exceptional development, investment and financing experience in these markets. Prime Kapital development pipeline: 21 000m2 completed, over 634 000m2 under development. MAS has revised its prior distribution growth guidance for the 2019 financial year of 30.0% to 15.0%. 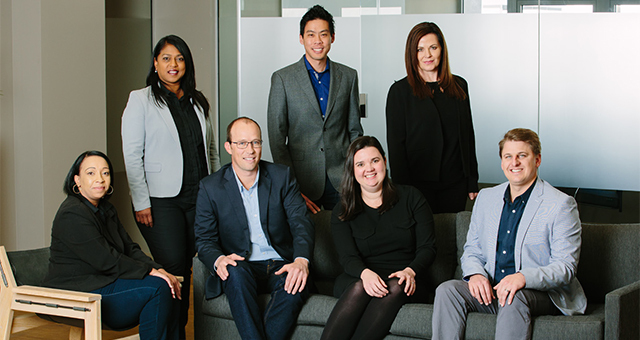 The prior distribution target was premised on being able to actively deploy capital raising proceeds into income-accretive acquisitions and developments. The markets MAS operates in have become progressively more competitive resulting in a slower than anticipated drawdown of available funds. MAS has a well-funded balance sheet, a strong development and acquisition pipeline and access to an experienced development partner with an exemplary track record in CEE. MAS provides us with a growing stream of euro-denominated distributions, underpinned by a growing portfolio of income-generating properties and a strong acquisition and development pipeline. Melt Hamman will be joining the MAS board of directors in 2019. 31.8% shareholding in AttAfrica, which is invested in four retail properties in Ghana and one in Zambia. At year end, our value in the Rest of Africa retail investments was R1.1 billion, comprising 3.8% (2017: 4.6%) of our total gross assets. In June 2017, the value totalled R1.2 billion and included our investment in The Grove Mall of Namibia, which was sold in May 2018. The proceeds of R191.9 million were used to reduce interest-bearing debt. At 30 June 2018, our equity accounted investment in Gruppo totalled R305.2 million (2017: R286.5 million). The net increase in investment value reflects the 5.1% weakening of the rand against the US dollar, offset by an impairment of R25.2 million. Our investment in AttAfrica, through its shareholder loan, was R787.3 million (2017: R776.2 million), being its gross loan of R953.9 million (2017: R908.5 million), net of an aggregate impairment of R166.6 million (2017: R132.3 million). AttAfrica repaid R99.3 million in capital and interest during the year, using funds from the external refinancing of Accra Mall. 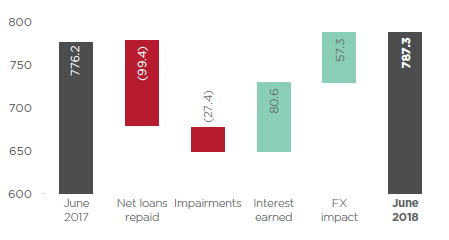 An impairment of R25.9 million was recognised against the loan in the current year (2017: R82.8 million) due to the increase in the negative net asset value position of AttAfrica. This is annually determined by an external valuation of the underlying properties. Currently we are not receiving regular cash distributions from AttAfrica, due to unfavourable trading conditions and the capital structure of our investment in AttAfrica. This capital structure, inter alia, gives us a 31.8% shareholding in AttAfrica which is higher than our obligation to contribute 25.0% of the funding requirements and therefore have a share of any capital growth in the underlying portfolio above our capital contributions. Hyprop Investments Limited has first right to operational income flows generated by the portfolio, resulting in irregular cash distributions to Attacq. AttAfrica shareholders are investigating options to create liquidity in the portfolio ahead of the June 2020 shareholder liquidity event. Failing to do so, the existing capital structure will be restructured. ^ Footcount annualised in first-year of trade. Data provided at 100% level. Accra Mall continued to trade well, with vacancies at year end largely due to the departure of Truworths and Identity. Vacancies reduced after year end. 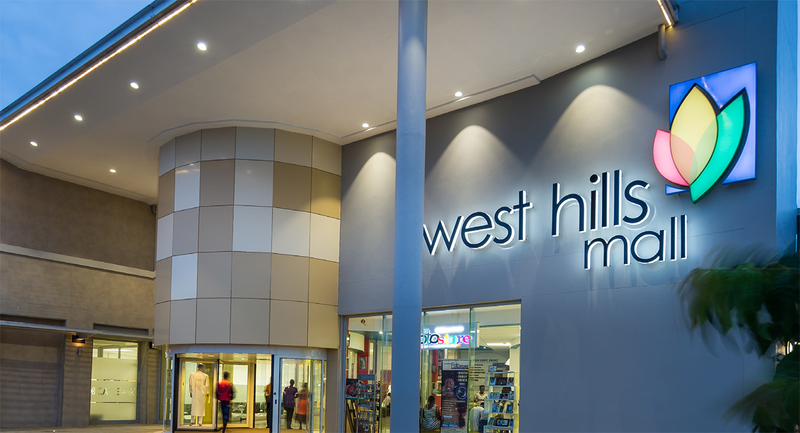 Substituting Game as the second anchor at West Hills Mall and Achimota Retail Centre is expected to impact both malls positively once opened in November 2018. This will also result in Shoprite being present in all malls and Game in every mall except Ikeja City Mall. Achimota has settled well since opening in 2016 as evident in lower vacancies and rising footcount. Operating income from Manda Hill Mall in Zambia was impacted by filling vacancies at lower rental levels during the year. While still challenging, trading conditions in Nigeria are improving off the back of moderating inflation, improved oil production and an increase in the availability of foreign exchange. Management’s focus remains on filling vacancies and tenant retention to optimise net income and asset value.